Have you ever wondered what it would be like to be the Emperor of your own nation? If you have then this game allows to be the king of your own kingdom and stake the money of your realm on this scratchcard game. Scratch away the pieces of the kingdom and unveil what lies beneath to win some huge cash rewards in this unique scratch card game. Since 1999 NextGen has been developing software for online casinos. They started out by providing land based slots to the online platform and since have branched out into their own unique and dynamic online slot and scratch card games. They have a widespread online presence across mobile, pc and social media, they have even won an award for the best social media games developer from EGR Magazine in 2012. 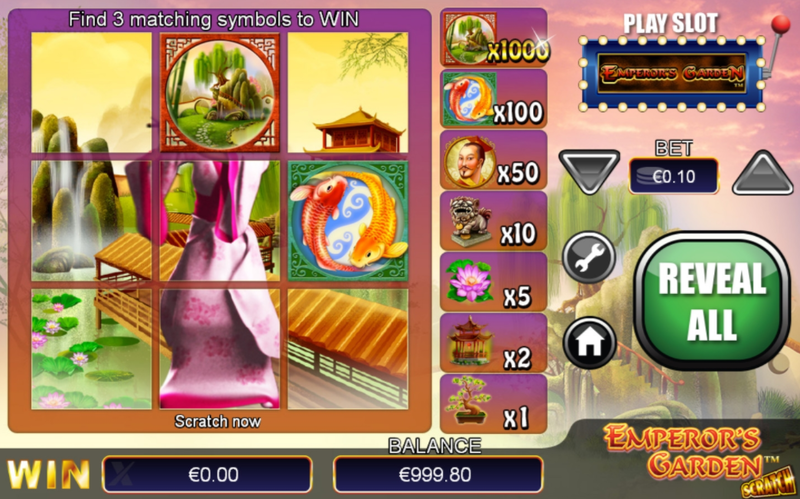 Emperor’s Garden Scratch is based on NextGen’s online slot game of that name. In this game, you get to be the emperor of one of the greatest nations in the ancient world. You will experience opulence and luxury on an unprecedented scale. As you would expect from a NextGen game, this online scratch card boasts outstanding graphics, with a brilliant background theme. Playing this game is simple and straightforward, you start by placing your bet at 1p to £2 per game. You will need to purchase lottery tickets which cover 9 areas on a 3 x 3 grid. Like a traditional scratch card, the symbols are covered with a protective layer, here you have the option of ‘scratching’ or rubbing them away individually or all at the same time with the Reveal All button. The goal is simple, you need to get a ticket with 3 identical images regardless of where they are on the grids. Different symbols have different values, an individual multiplier is anywhere from 1x to 1000x assigned to each symbol. That means your maximum jackpot for one winning combination could be £2000! Straight out of Chinese history, you have symbols such as bonsais, lotus flowers, the yin and yang, goldfish and pagodas all designed to make the game look beautiful. The Emperor’s Garden scratch card is a fun, basic scratch game that will appeal to most scratch players, traditionalists and online contemporary game enthusiasts. The simplicity and basic winning structure make this an ideal game to play without any experience or learning curve. You’ve also got an impressive theme with superb graphics making this online scratch card game one that you will keep coming back to.